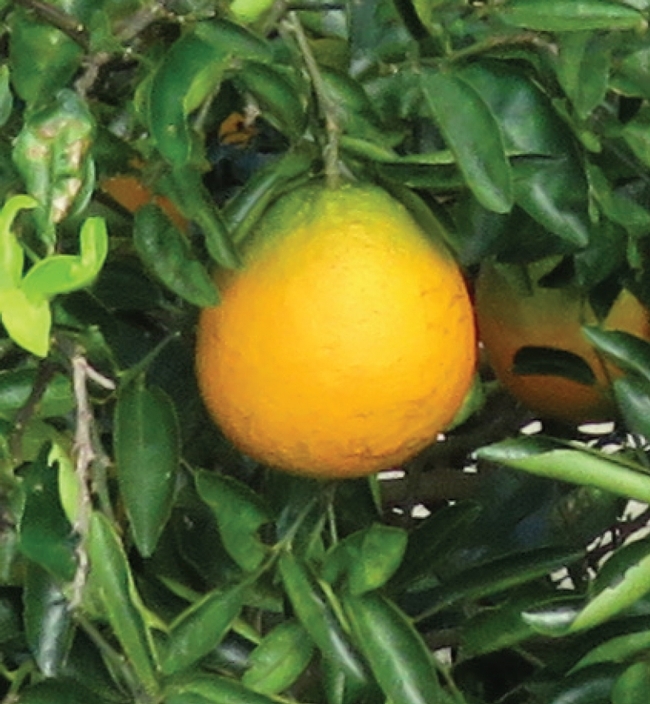 All Citrus cultivars tested so far are susceptible to Huanglongbing (HLB), but they are not equally susceptible. 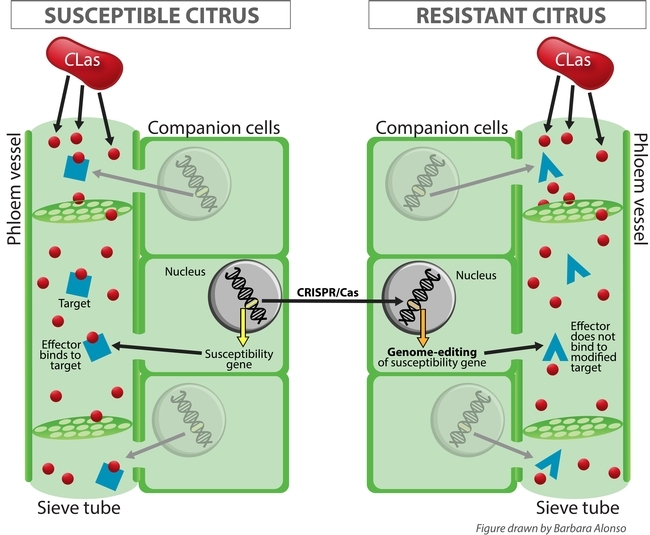 Some are able to grow and produce a fairly normal crop, despite supporting high populations of the HLB-associated bacterial pathogen and developing leaf symptoms. 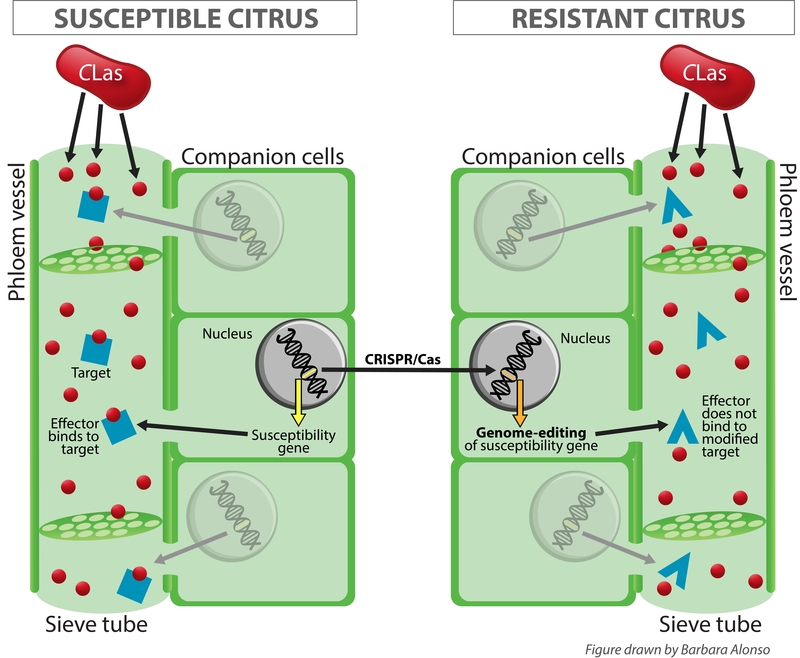 Dr. Ed Stover, a Research Horticulturist at the USDA in Fort Pierce, FL, is collaborating with scientists on developing HLB-tolerant citrus. 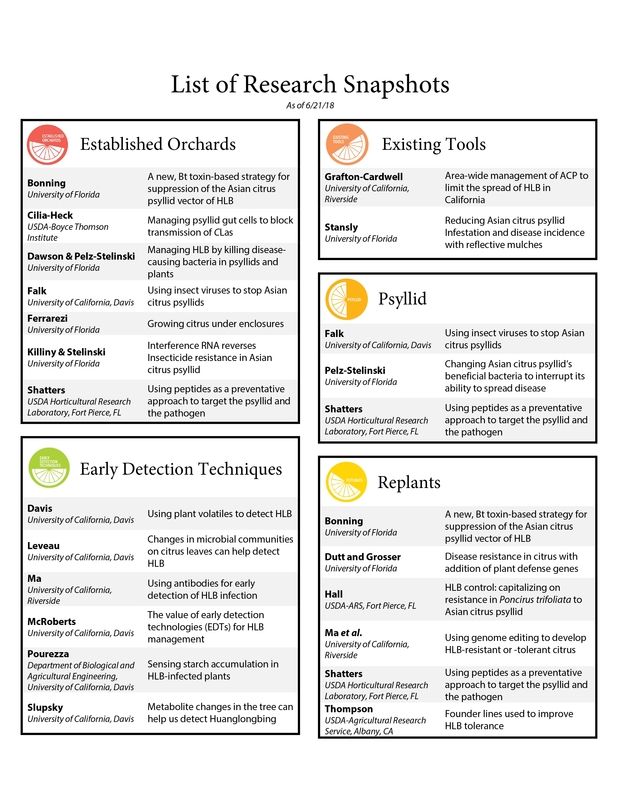 How are new varieties developed? Download the Research Snapshot to learn more. Dead psyllid in feeding position on Specialized Pheromone and Lure Application Technology (SPLAT®) card. Photo credit: Justin George and Stephen Lapointe. 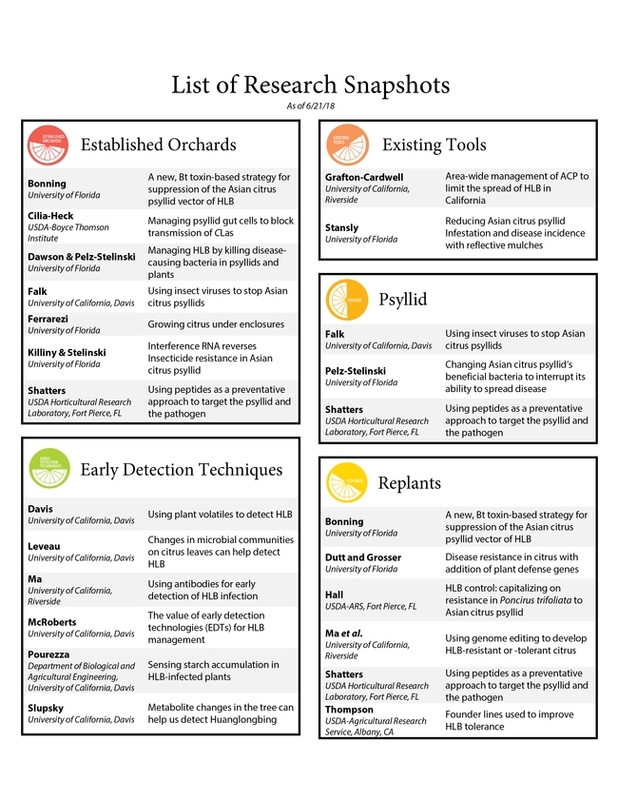 Attractants for insect pests of agricultural crops play an increasingly important role in management programs. Chemical, visual, and auditory cues that attract insects are identified during laboratory investigations and then verified for their attractiveness in the field. 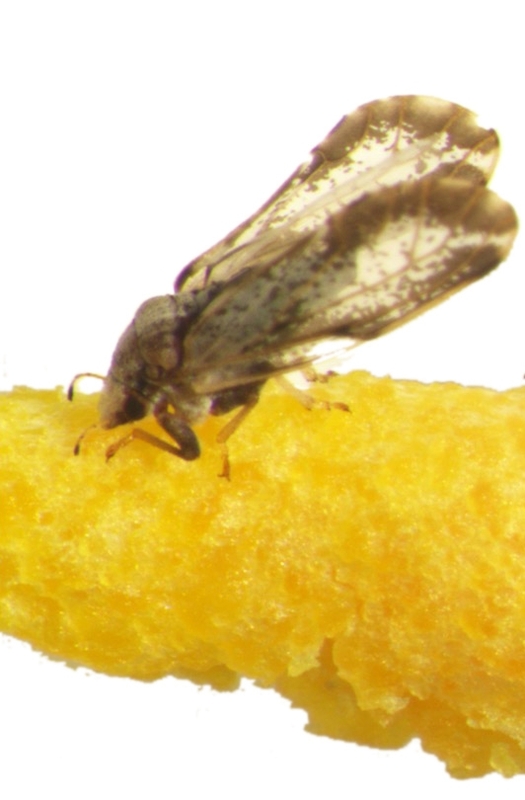 Dr. Lukasz Stelinski, an Associate Professor at the University of Florida, is researching attractants and traps as a way to deal with Asian citrus psyllid (ACP), in order to reduce the incidence of Huanglongbing disease. How do the traps work? Download the Research Snapshot to learn more. Tamarixia wasp laying eggs under ACP nymph. Photo credit: Mike Lewis, Center for Invasive Species Research, UC Riverside. 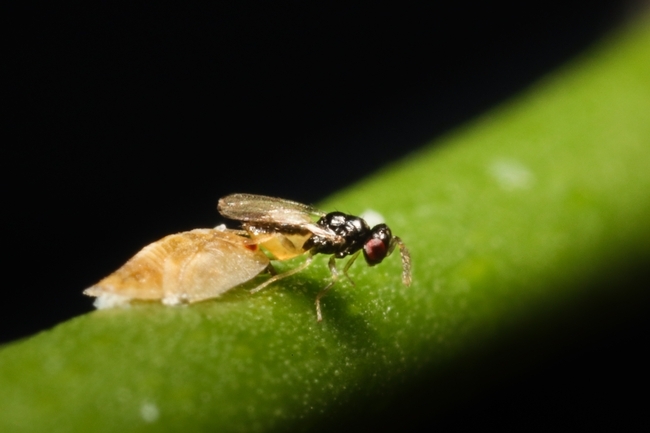 Dr. Mark Hoddle, a research scientist at the University of California at Riverside, is establishing the biological control agent, Tamarixia radiata, a parasitoid that attacks Asian citrus psyllid (ACP) nymphs, an invasive pest infesting citrus and spreading the deadly huanglongbing disease. How does Tamarixia kill ACP? 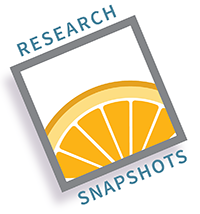 Download the Research Snapshot to learn more.